Whether it is projection or speculation, there have been discussions in the news that oil could reach $200 a barrel and gasoline could reach $10 a gallon in the not-too-distant future under some scenarios. It's presently around $120 and $3.60 or so (above $4 in some regions - $3.79 would be $1 per liter). Of course gasoline prices have been higher than this in Europe and other regions for quite a while, but the current prices and projections like these have many Americans up in arms (and make me glad I bought a Prius, which is back to giving me ~50 miles/gallon now that my snow tires are off). There is also discussion of a summer moratorium on the $0.184/gallon Federal excise tax. McCain and Clinton have endorsed this, though it's a ridiculous band-aid or PR stunt that encourages gas consumption and probably won't even lower consumer prices. This is what passes for "energy policy" in this country. As Thomas Friedman points out in this op-ed piece, the US really doesn't have an energy policy. It is astonishing that Congress has failed to extend tax credits for alternative energy research and production (mainly solar and wind). 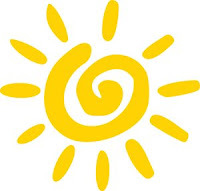 The oil and gas industry continue to get their credits, but it is the still-embryonic solar and wind industries that really need this help to attract investment and help them to grow to the point where they can operate without subsidies. Fortunately other countries such as Germany and Spain are subsidizing alternative energy R&D and starting to build industries in these fields. It's pretty clear that the Bush administration is as brain-dead on energy as it is on most issues, but it's worrisome that none of the three presidential candidates seems to be paying much attention to this beyond McCain and Clinton supporting the crazy summer gas tax holiday. 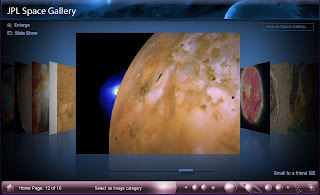 The JPL Space Gallery has a nicely re-designed interface for browsing through the many beautiful images returned from various NASA spacecraft. The main interface works just like the "cover flow" album art browser on an iPod. Each gallery section can also be viewed as a full screen slide show. Very cool. Speaking of going with the space flow, this week is the one year anniversary of the Carnival of Space. To mark the occasion, carnival founder Henry Cate will be hosting this week at Why Homeschool. If you're a space/astronomy blogger, help Henry make it a really big show by submitting a post by Wednesday evening. This is the official trailer video for the UN-declared International Year of Astronomy 2009 (IYA2009), marking the 400th anniversary of Galileo's use of a telescope for astronomical observations. Additional info and video formats here. Thanks to astropixie for pointing this out! Cool video. This weekend I'm driving a lot and listening mostly to the "last two weeks" play list on my iPod. I've downloaded some really cool music recently, including the new Weepies album Hideaway - strong songwriting and gorgeous harmonies. I also love Vampire Weekend, a NYC indie-band with African-style guitars, quirky lyrics, and a sound that sometimes reminds me of The Police. Another recent download was Volume One by She & Him, a duo consisting of M. Ward and winsome, doe-eyed actress Zooey Deschanel (pictured). Their sound is quite retro, reminding me of early sixties girl groups and even the Mamas and the Papas. Finally a great find via iTunes' free single of the week, Worriesome Heart by Melody Gardot. This 22 year old singer-songwriter has a voice and style somewhat reminiscent of Norah Jones. She was badly injured in a bicycle accident when she was 19, and a doctor recommended that she take up music to help overcome neurological problems. Although she remains disabled from her injuries, her musical "therapy" really helped her and also revealed an amazing (and fast developing!) talent. Stephen Hawking was in the news recently for a speech on the importance of space for the future of mankind. While reading and writing about that, I noticed a link to a children's book Hawking had published last year with his daughter Lucy Hawking. I hadn't heard about it before, so I ordered the book from Amazon the other day, and I read it last night. George's Secret Key to the Universe is intended for kids 9-12, but I found it quite enjoyable as an adult reader with an interest in physics and astronomy. It's written as a sort of science fiction adventure story about a fairly ordinary boy (George) and his rather less ordinary scientist neighbor, Eric. The physics and astronomy bits are blended into the story and are scientifically accurate and clearly explained without being greatly dumbed down (there are photos and side bars to further explain astronomical facts). Eric's mode of space transportation - an intelligent laptop supercomputer named Cosmos who can open up a portal to any known part of the universe - is not very realistic. But that's OK - it's a concession that allows comets, planets, stars, and even black holes to be quickly accessible, though not completely safe. In the story, Cosmos is not simply creating a convincing virtual reality simulation of space (though he can do that too), he's really sending people there, and if they aren't careful, they may not come back! There's even a bad guy in the story to add some plot tension. It's a fun and easy read, and somewhat of an eye-opener for me. I have often promoted the benefits of the first-person approach of the Orbiter space flight simulator - "you are there" as a simulated astronaut in a game-like program with realistic physics and realistic 3D depictions of things in the solar system. Fun, but also pretty complicated. This book isn't first person, and it's not a simulation - but it sort of feels like one, because you can really imagine being in George's place. Of course that's one of the roles of fiction, to provide such vicarious experiences by stimulating your imagination, and if it's done well, this can be exciting and fun. The Hawkings do a great job with this book, where the adventure involves real-world space, astronomy, and physics rather than the magical world of (say) Harry Potter. I think kids and adults who like reading books with a substantial story line will find the adventures of George and his friends to be quite a good ride. It's back, and bigger than ever! Carnival of Space #51 is open for business at astroengine.com (which oddly enough is really astroengine.net, but whatever). Check it out. I was especially interested in Emily's Planetary Society Weblog report on thermal analysis detective work related to the Pioneer Anomaly. And the ants in space thing too. On the 18th anniversary of the launch of the Hubble Space Telescope, the HST team has released 59 beautiful images of interacting or colliding galaxies under the title "Galaxies Gone Wild!". 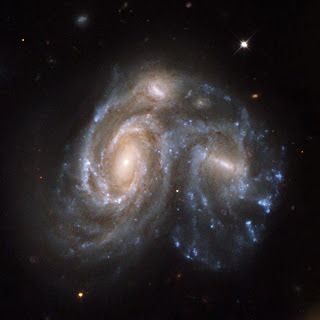 This one is NGC 6050 (courtesy hubblesite.org). 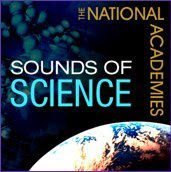 The National Academies (of science, engineering, and medicine) have a weekly podcast called "The Sounds of Science" (you can also subscribe to these podcasts through iTunes). There's a wide range of topics, and the podcasts (each typically 10-11 minutes) are most often tied to social and educational issues. I listened to a recent one, "The Reality of Virtual Reality," and another one on "Grand Challenges for Engineering," and both were very interesting and well done. Related to the second topic is their Grand Challenges for Engineering web site. The 14 challenges they have identified include making solar energy economical, preventing nuclear terror, and reverse engineering the brain. And those are just the easy ones (not really). The National Academies also have a lot of great publications, some of which are available as free PDF downloads simply by registering for their site. Good stuff. In a NYT op-ed piece titled "Running Out of Planet to Exploit," Paul Krugman wonders whether this time, with oil at $117 a barrel and Australia in its tenth year of drought, we might really be facing massive food and energy shortages that will hurt lots of people and trigger all sorts of bad side effects. It's a big world, but it's feeling noticeably finite, isn't it? But as I and many others have written before, the sun is an immense source of energy, and the Moon and near-Earth asteroids hold immense stores of various materials. 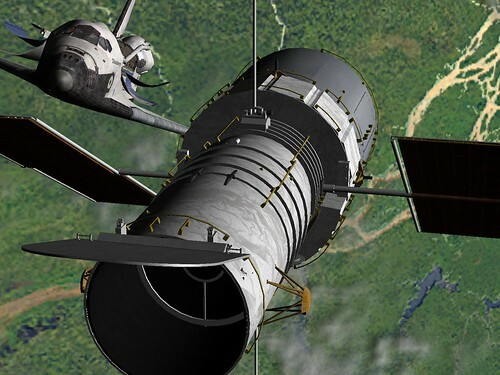 Not that we can use these next year or even in ten years, but if we can develop better access to space, we will have more options. And speaking of more options, acclaimed physicist Stephen Hawking gave a speech on the occasion of NASA's fiftieth anniversary, calling for much greater investment in space development, leading to colonies on the Moon and Mars. He argues that the world should devote about 10 times as much as NASA's current budget to space development, around 0.25% of the world's financial resources - a lot of money but a tiny fraction of our available resources, and a true investment in the future. Not that this will be easy or quick, but it would represent a real insurance policy for humankind, and we can certainly afford to do this while still working to keep things under control here. He supports NASA's plans to return people to the Moon by 2020 and to get humans to Mars soon after that - first steps in permanent settlement. Hawking has spoken before about his concern that natural or human-made disasters could wipe out life on Earth (or at least human life). He's not the only one worried about this, but I'm afraid things will have to get a lot worse before many people will start to take seriously the need for a backup plan for humanity. I hope we will act before things get really, really bad as in John Barnes' alternate near-future SF "Kaleidescope Century" series, but I'm only vaguely optimistic that we will. I like those books, but I wouldn't want to live there. "Evolution as described by Charles Darwin is a scientific theory, abundantly reconfirmed, explaining physical phenomena by physical causes. Intelligent Design is a faith-based initiative in rhetorical argument. Should we teach I.D. in America’s public schools? Yes, let’s do it – not as science, but alongside other spiritual beliefs, such as Islam, Zoroastrianism and the Hindu idea that the Earth rests on Chukwa, the giant turtle." 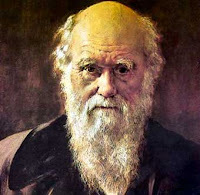 His books include The Song of the Dodo and The Reluctant Mr. Darwin. It’s unfortunate that so many people in this country oppose evolution (or the teaching of it) when it is so established and essential in biology and even demonstrated in applications of biology (e.g., to understand and deal with bacteria that evolve drug resistance) and can now be studied directly in the shared DNA of all the life forms on this planet. Part of the problem is that what many people oppose is a cartoon version of evolution. They didn’t evolve from any chimp! Neither did I – humans and chimps both evolved from a long-extinct common ancestor species around 5-8 million years ago. They also don’t seem to understand or accept how closely related we are to all living things on Earth – all plant and animal cells are running “programs” written in the common language of DNA. Closely related species such as chimps and humans have a large percentage of DNA sequences in common (95% or more), but strings of DNA (genes) that code for bioluminescence have been transferred from jellyfish into the genomes of pigs (among other organisms). How is it that there is this great genetic commonality even across widely different species? It’s because evolution produced all the machinery of life from a common beginning. So of course scientists should exclude ID and its proponents from their scientific journals and conferences – just as they would logically exclude people who would assert that soccer or stamp collecting is part of that scientific discussion. Soccer and stamp collecting are valid subjects of interest, but they aren’t part of biology, and if you submit a paper about soccer or stamp collecting to a biology journal, it will not be published, even if it's a great paper. Just because people assert that they are talking about the same thing doesn’t mean that they are! Evolution explains how life works on this planet as a physical process with physical chains of cause and effect (albeit extremely complex and long-acting chains of cause and effect). ID asserts things based (perhaps) on literary analysis, but it produces no testable hypotheses and it explains nothing in the realm of science. If you take a religious argument and label it as science, it's still a religious argument. There’s a quote from Elvis Costello, "Writing about music is like dancing about architecture - it's a really stupid thing to want to do." I’m not sure I completely agree with that since I’ve both written music and written about music, and I like listening to music and reading about it too. But ID and creationism are definitely dancing about biology, and they are not bringing anything useful to the party. 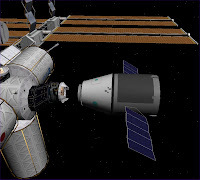 Bigelow Aerospace is working to develop and launch private space stations in the next few years, and their unmanned test satellite Genesis II has been orbiting since June 2007. 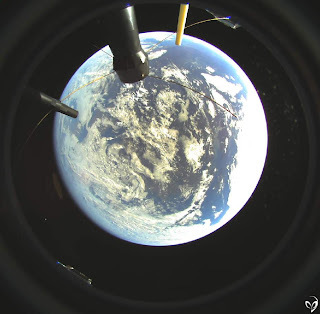 They have recently tweaked the on-board cameras to send back higher resolution images, as well the fish-eye whole Earth view shown here. Thanks to Bad Astronomy for the tip. The Carnival of Space is quickly approaching its one year anniversary, and Carnival #50 is now available for your reading pleasure over at KySat.com. There are a number of interesting posts - I especially liked Centauri Dreams' post on "Life as a Rarity in the Cosmos" (though the problem of extrapolation from N=1 pretty much leaves all such discussions in the category of educated guesses). I would like to comment on Space Cynics' post "More Ritalin Please... Generation Y is here" but no time today. I'm at a hotel next to London Heathrow Airport tonight and my third floor window is opposite the midpoint of a busy runway. Just for fun (and in spite of a very simple digital camera) I tried taking some pictures of the jets just as they lifted off, following their motion with the camera. But none of the pictures came out as cool as I had hoped. This one is maybe not too bad. 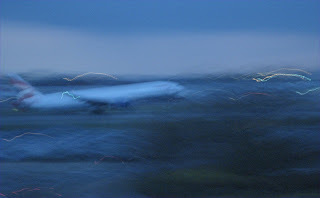 At least you can see that it's an airliner (and British to boot). Last week, Fraser Cain of Universe Today (who also organizes the Carnival of Space) sent out a call to space bloggers for brief comments on why we should spend money on space exploration “when there are so many problems here on Earth.” He gathered the responses into a very nice blog post. I was busy and traveling and didn’t have time to submit something. My past comments on this subject suggest that I would have had trouble with the “brief” part anyway. Having read the original posts and some of the comments, I decided to write a sort of “meta post” and look at this whole thing from a level up. It seems that the pro’s included various “it’s what we do” arguments (inspiration, sense of wonder, scientific curiosity, the need for a challenge, the human drive to explore, it’s the modern version of building a cathedral, etc. ), several “backup plan” arguments (what if something destroys the Earth, we want to avoid the dinosaurs’ fate, create colonies, etc. ), various economic arguments (stimulate science and technology, generate technology spin-offs, generate high tech jobs, generate solar power in space, exploit valuable lunar or asteroid materials, etc. ), and education, which I think overlaps several of those categories. Probably there are some others too, like contributing to world peace through international cooperation in space, and several who said “we have enough wealth and brains to explore space and solve problems on Earth.” I agree with most of these! There are a lot of good points here on both sides of the issue. It’s clear that telling someone that NASA’s budget is “only” 0.6% of the federal budget doesn’t hold much weight if that person doesn’t care about space (it’s still 17 billion bucks). People who are inspired by football or Impressionism may not buy the space cathedral argument. It’s also not really a single question or issue. If you ask “why should the US government spend money on NASA to do this or that,” you narrow it down for Americans, but Americans are not the only ones exploring space (though NASA’s budget is the biggest government space budget). There’s human vs. robot exploration (plus combined approaches). 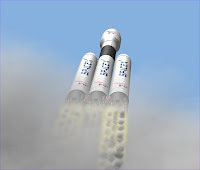 There are other countries and there are private space technology developers too. 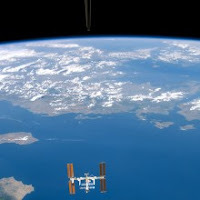 Space is there, and it’s been shown to be valuable technically, economically, and politically at various levels, so space will continue to be exploited and explored by someone, sometime. These are really questions about priorities more than anything else. It may not sound very passionate or original, but I think the answer can be summed up in a few well-worn clichés. Things like “all things in moderation,” “don’t put all your eggs in one basket,” “listen to both sides of the story,” “if at first you don’t succeed, try again,” “never say never,” and “don’t stop thinking about tomorrow” (OK, that’s a song lyric). I really think that a diversity of goals and approaches, cooperation and competition, plus economic self-interest will ultimately get us there in space (wherever “there” is), and if some things happen a few years later than I would like, it’s not the end of the world (usually). Is this too Pollyannaish, “everything will just work out?” Maybe so, but there are a lot of interested parties and a lot of good things happening already, and as long as you don’t impose the constraint that “America must dominate in space,” I think amazing things will happen in space over the next 10 to 20 years. As for NASA, I do wish that they could figure out how to do a better job on educating the public about what they do (so much of it is awesome), and I wish they would allocate just a bit more money to new private space development. There is also one thing that everybody should remember: all the money ever spent “on space” was really spent here on Earth, for salaries, education, technology, many things, and yes, this money has also bought us a lot of inspiration in addition to many practical benefits. You don’t have to go to Liverpool to know that the Beatles rock – but it sure is cool to do if you’re any kind of Beatles fan, as I am. Today I first visited “The Beatles Story” museum at Liverpool’s historic Albert Dock. It was frankly a little tacky but still essential, if only for the final display of John Lennon’s “White Room” – a re-creation of the room of his London home in which the “Imagine” video was recorded. There was a pair of Lennon’s trademark wire-rim glasses on a white piano like the one he played, and of course “Imagine” was playing. I found it pretty moving. The other displays and audio narration depicted scenes from the well-known stages of the Beatles’ career. I was struck by the fact that their first guitars (several on display) were just as crappy as my first few guitars. I didn’t learn anything new but I always enjoy walking down that particular memory lane so I didn't mind. The Magical Mystery Tour was much better, with a very knowledgeable guide to point out all sorts of odd facts and unusual coincidences. Our distinctively painted bus stopped at the childhood homes of all four Beatles (a bit creepy standing with a group and taking pictures of the homes that are now occupied by people who have nothing to do with the Beatles, but we did it). 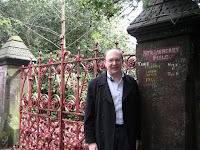 We saw many other notable Beatles sites and stopped at a few, including Penny Lane and the Strawberry Field gate, where I posed for the obligatory photo shown here. The Beatles were probably my biggest influences as a songwriter, and aside from that, I grew up with and still really love their music. Unfortunately time and weather didn’t allow for a trip on the Mersey Ferry as I had hoped. It was pouring and I missed the ferry I had intended to take to visit the Spaceport museum. Oh well – space is everywhere, and you can’t say the same for the Beatles’ home town. I’m in the UK for a week to visit some customers in Wales, Scotland, and the Greater London area. For the Wales visit I’m staying in the nearby city of Chester (which is actually in England, just on the border with Wales). Chester has been a walled city since Roman times, though the walls have been modified and expanded in medieval and even in modern times. There’s a walkway along the top of the wall and I walked most of it (one section had collapsed recently and was closed). It’s a nice little city. Sunday morning I will take a 20 minute train ride into Liverpool, mainly to do a sort of Beatles pilgrimage day. 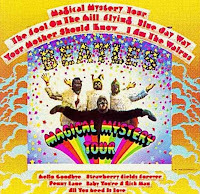 I plan to take the “Magical Mystery Tour” (what else would you call a Beatles bus tour in Liverpool?) and maybe the Beatles museum. There could even be a space connection depending on how the time goes. 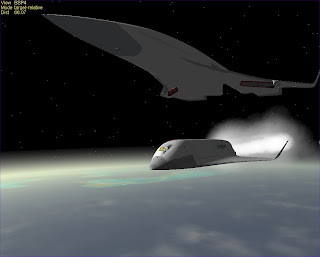 This week's Carnival of Space hails from Great Britain, where I will soon be traveling. Will Gater is an astronomer and a writer for (among other things) BBC Sky at Night, which is a fine astronomy magazine. Will does a nice job presenting this week's diverse collection of astronomy and space bloggers' observations and thoughts. Check it out. And speaking of bloggers from Britain, thanks to Stuart of Cumbrian Sky, I learned about blogged.com, and discovered that my blog has already been listed and reviewed there. Their editors gave Music of the Spheres a rating of "great" with a score of 8.2 out of 10. I never aspired to Greatness or even greatness in the Blogospheric Vastness, but as Eeyore says, "thanks for noticing me." Things are crazy at work since I'm leaving Friday afternoon for a week on business in the UK. 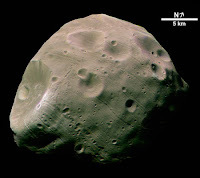 So not much time to read or write about space developments, but I just had to mention the great shots of Phobos obtained recently by MRO (Mars Reconnaissance Orbiter). 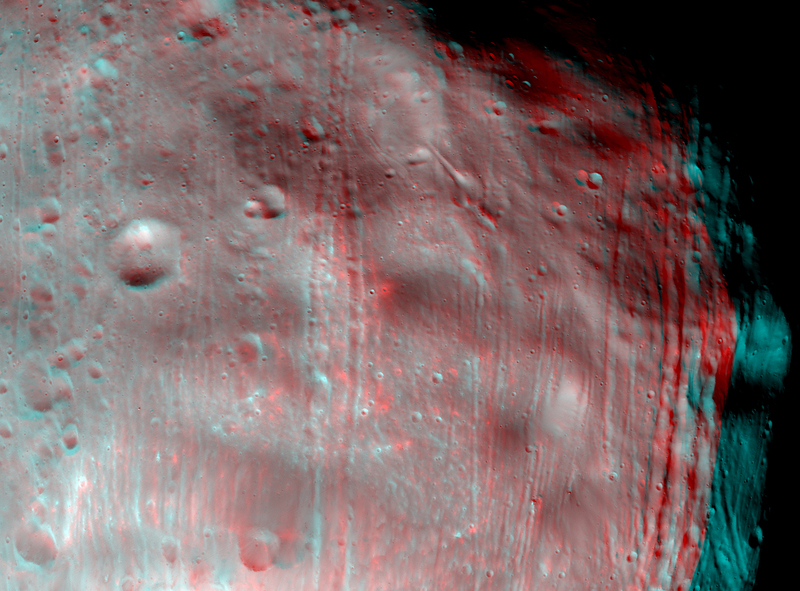 They even did some stereo imaging with pictures captured 10 minutes apart, and the red/blue 3D anaglyph is really spectacular, as are some of the crater Stickney details. As usual, Emily at the Planetary Society Weblog has detailed comments on the imagery. Visually speaking (if your eyes were actually there), Phobos is quite a bit darker than shown in these images, as Emily explains. 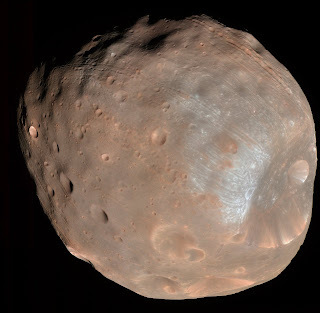 This picture (one of mine from Orbiter) demonstrates the contrast between Mars and Phobos. But whatever the color, the detail in the new images is really amazing. One problem with these images is lack of scale. I tried to set up something in Orbiter with a space shuttle near Phobos to give some sense of scale, but the shuttle is just too small, and I couldn't get anything really useful. While Phobos is "tiny" by planetary standards, it's still quite a huge object. Note the 5 km scale bar in this older (c. 2006) image. After mentioning Steve Grand (not pictured!) in my recent post on AI, I decided to check on what he's up to these days. I revisited the web site of his company, Cyberlife Research, which is full of fascinating material on his various projects, along with a good dose of quirky humor (and some annoying frames). It hasn't changed much since 2006, but it's definitely worth some exploration if you are interested in artificial life, "hard" AI, simulation, robotics, etc. He has added a link to another interesting web site called Machines Like Us, whose subjects are "evolution-cognition-artificial life." There are a lot of great articles archived here, written by a wide range of fascinating people. They also host a very handy Live Godcam. Thinking Machines Corporation was a supercomputer company back in the 1980's and 1990's, founded by computer scientist Danny Hillis. They had a great motto, "We're building a machine that will be proud of us." They didn't manage to do that, but it really seems like evolution, intelligence, and life are starting to make the jump from biology to technology. 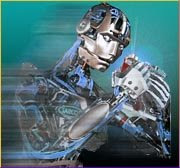 Could our descendants turn out to be machines, or biological/technological hybrids? Why not? We're machines, and although we're complicated, there's nothing especially privileged about the "wetware" we currently run. But it does allow me to enjoy this pinot noir. Thanks to astropixie for pointing this out - a cool video of still images taken from the ISS of cities around the world at night, narrated by astronaut Don Pettit. I saw Pettit present this video at ISDC 2007 in Dallas last May, so I'm happy to find it on the web now. He talked about how they had improvised the "barn door tracker" from spare parts found on board the space station, which allowed them to get very sharp time-exposed images (previous hand-held digital camera images had been very poor). The still image above is an example from 2003. It's London, where I will be heading on Friday for another business trip. I’ve been interested in artificial intelligence (AI) for many years. Back in the mid-1980’s one of my spare time projects was playing around with computer languages such as Logo and Lisp on my Mac, and studying books about AI and “expert systems,” which were a big thing in those days. At the time, there were special workstations called “Lisp machines” that were used for AI research and to develop expert systems. I was so into this AI stuff that I nearly went to work for a Lisp machine company called Symbolics. The job offer luckily fell through because it turns out the company was in trouble (the guy who had offered me a job had suddenly lost his). AI wasn’t ready to be a business and Lisp machines would be replaced by general workstations (Sun, VAX, etc.) and with more powerful PC’s and Macs. So I dodged the bullet on that one. It seems that whatever we can’t figure out how to make computers do might be called AI – but once we figure it out, it becomes a software engineering tool. So we have limited speech recognition even in our mobile phones, and there are web pages that translate text between various languages, but we don’t consider them to be especially intelligent. But intelligence, natural or artificial, is still fascinating stuff. How do our brains do what they do? AI researchers have been "on the verge of a breakthrough" since the fifties, but intelligence is a lot more complicated than physics (it's more like engineering). Sure there are impressive programs for playing chess, for simulating human behavior in sports or military strategy games, for financial trading, etc. But these specialized programs don’t have the common sense of three year old human (or probably even a fly). I’m currently reading The Emotion Machine, a 2006 book by Marvin Minksy, one of the pioneers of AI since the fifties. It’s interesting in its concepts but frankly a bit tough in the actual reading. It’s very structured (though less so than his earlier book The Society of Mind, which I never managed to finish). He is still concerned with the problem of how a system made up of many unintelligent sub-systems (artificial or natural, such as a brain) can be “intelligent.” The most useful thing I’ve gotten from the book so far is the idea of “suitcase words” – words such as “consciousness” which seem at first glance to be well defined (we know it when we feel it!) but on closer examination are more like labels for a wide range of phenomena and thus don't explain very much. As clearly as we may feel we can distinguish consciousness from non-consciousness (at least our own), it may not be the most essential thing about our intelligence. It may “simply” emerge when all the parts of our brains work together in “bottom up” fashion. For a more readable introduction to the possibilities of creating artificial life forms on a bottom-up basis (which of course must include include some level of AI), I suggest finding a copy of Creation: Life and How to Make It by Steve Grand. I wrote about it in 2006, and I still think his idea that you have to consider the whole organism (not just the brain) is quite sensible. And speaking of bottom up, there’s a fascinating story on the Blue Brain Project that was in a recent SEED magazine article that is now on-line (it triggered this unexpectedly long post). This supercomputer project in Switzerland has managed to construct an accurate working software model of a neocortical column, the basic functional unit of the brain. I won’t try to summarize it here, and they say they are really doing neuroscience research and not “trying to build a brain.” But dude, they are building a brain! I think the future is going to be as weird as many SF writers have suggested. Carnival of Space #48 is up and running over at Next Big Future. I especially liked the "Mars or Arizona?" photo-feature at Starts With A Bang. 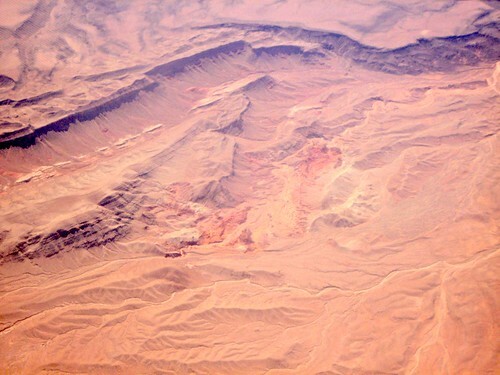 The photo here is one of mine and is neither Mars nor Arizona, but actually southern Utah (not far from Arizona). I took it on a flight from LA to Boston last year. It's remarkable how Mars-like some of the American Southwest can look especially from around 10,000 meters up. It's actually just "BSP" but Greg Burch's Big Space Plane 4.0 is freakishly big (click to see a larger picture and check the size of the pilots in the cockpit window). This view shows it firing its rocket engines after having been dropped from its "first stage" carrier aircraft. I took off from KSC, flew east, and climbed to an altitude of about 56 kilometers for the drop, flying at roughly Mach 11. I haven't written a new song since 2005 - sad but true. I'm doing lots of other stuff, and songwriting takes energy and focus, as well as time to let your mind wander, to play around with guitars and keyboards and words, things like that. Things that are in short supply these days. But I'm still a songwriter and I know I will get back to it. I'll turn some of those promising song fragments into complete songs, and even make a new CD (I've got four tracks from 2003-2004 "in the can" - which is actually a hard drive, of course). The last song I recorded in 2004 was "Gonna Start Winning" which I really like. You can listen and download here (there are two songs from my 2003 CD there too). This reflection was prompted by a new blog I just discovered, Measure for Measure, a New York Times blog written by several songwriters (Andrew Bird, Darrell Brown, Rosanne Cash, and Suzanne Vega). They will write about the creative process, about songs in the making. Maybe this will be just the push I need to start writing again myself. If I can find time to read the blog.